For fuller details, please go to the Waveney Valley Ecumenical Partnership website . Second Sunday of the month United Service with CofE in Memorial Hall 10.45. 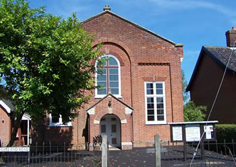 This Church is in the Waveney Valley Ecumenical Partnership. The Partnership's page on this website is here. The Partnership has its own website here. A list of all the churches in The Waveney Valley Ecumenical Partnership can be found lower down this page.